Fracking: Coming to a Backyard Near You? Here in western Pennsylvania we see how close fracking operations can come to people’s homes; the people living in the cluster of houses on the left have to live with the commotion around the well pads a stone’s throw away on a daily basis, and the massive fluid retainment ponds in blue could pose a threat to their health. Click on the image for a fullscreen version. The story in West Virginia is very similar. Here a fracking well pad is less than a football field away from someone’s home. Click on the image for a fullscreen version. Often times, many of the people that will be affected by a new fracking operation have little to no say in the matter. People are typically powerless to stop construction of a drilling site on a neighboring property, and don’t have any say in where and how the site and associated roads and utilities get built, even though they will still have to deal with the increased noise, light, and traffic, as well as decreased air quality. Health concerns are a major issue because fumes and volatile organic compounds (VOC’s) originating from well pads and fluid retainment ponds have been linked to respiratory and skin illnesses. Fracking operations have also been known to contaminate people’s drinking water by causing methane migration, posing an explosion hazard, and fracking fluids that have made it into the water table can render water unsafe for drinking, bathing, and even laundry. Accidents like fluid spills and well blowouts are an ever-present threat, with the potential to send thousands of gallons of fracking fluid spewing into the air and onto the surrounding landscape, as happened to a well in Clearfield County, Pennsylvania in 2010 that resulted in more than 35,000 gallons of fracturing fluid contaminating the environment. Local campers had to be evacuated from the area. Hydraulic fracturing has really taken off in the last decade thanks to horizontal drilling technology. Here, in this section of southwestern Pennsylvania, we can see how rapidly fracking operations have expanded near the Pittsburgh area. The colored dots show the locations of new drilling sites similar to the ones shown in the images above, identified with help from our FrackFinder volunteers. Because of its location over a particularly rich part of the Marcellus Shale, Pennsylvania has been one of the states most heavily impacted by the fracking boom, but fracking has begun to take off in other states as well. These include Ohio and West Virginia, where along with Pennsylvania you’ve helped us investigate and map drilling activity through our FrackFinder project to quantify the growing impact of fracking in each state, and make the data available to the public and to researchers investigating the impact of fracking on public health and the environment. Ohio sits partially atop the Utica shale. This map shows the locations of well pads built between 2010 and 2013 in a small part of the eastern portion of the state, and the access roads that were carved out to support them. Click on the image for a fullscreen version. Fracking is relatively new to West Virginia, and the topography is rugged (as shown by this shaded-relief map), so well pads aren’t yet spaced as densely as they are in states like Pennsylvania. The red polygons represent well pad construction, and the dark blue represent retainment ponds. Click on the image for a fullscreen version. If you’d like to learn more about fracking and how it impacts people and the environment, be sure to check out Jerrilyn’s story map for an in-depth look! /wp-content/uploads/2016/08/test_logo.png 0 0 Demian Nunez /wp-content/uploads/2016/08/test_logo.png Demian Nunez2017-03-30 13:39:472018-12-24 15:21:28Fracking: Coming to a Backyard Near You? Mountain Top Removal in Appalachia: What’s in your backyard? SkyTruth’s new Mountain Top Removal visualization tool is now available to inspect active mining data for 74 counties in Kentucky, West Virginia, Tennessee and Virginia. The website can be accessed at SkyTruthMTR.appspot.com. The maps leverage tens of thousands of mining footprints, the result of SkyTruth’s mountain top removal (MTR) research. Before expanding to 74 counties, the orginal work included 59 counties and identified an estimated 445,792 acres of new mining over a 30 year period. This data has already allowed outside organizations and research institutions to directly link MTR to downstream water pollution and related environmental destruction, as well as provide input into numerous health studies and predict where coal companies might go next. Click anywhere on the map to see its active mining history. Visualize a timeline of active mining from 1985 through 2015, with zooming available right down to the rooftop. Draw a rectangle or polygon on the map, then see a breakdown of mining in that area by year and as a percentage of the total selected area. Once drawn, shapes can be edited. Click on one of the 74 counties and see the total active mining for that county by year. Use standard Google maps for a baseline, then overlay with one of SkyTruth’s composite images for any year from 1985 through 2015. These images combine the best satellite photos for each year into a single layer. https://skytruth.org/wp-content/uploads/2017/03/MTRvis.png 1898 3835 Dan Cogswell /wp-content/uploads/2016/08/test_logo.png Dan Cogswell2017-03-27 22:00:042018-08-21 09:37:31Mountain Top Removal in Appalachia: What’s in your backyard? Sentinel-1 satellite radar image of the northern Gulf of Mexico, taken about 7:30 pm local time on February 14, 2017. Oil slicks are dark streaks. Ships and oil/gas platforms are bright spots. South Pass of the Mississippi Delta is at left. Image courtesy European Space Agency. As usual, we can see a 9-mile-long slick emanating from that chronic oil leak that has been spilling oil continuously since 2004. 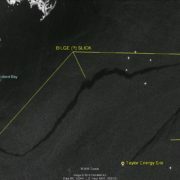 The Taylor slick is drifting straight to the northeast away from the leak source on the seafloor. 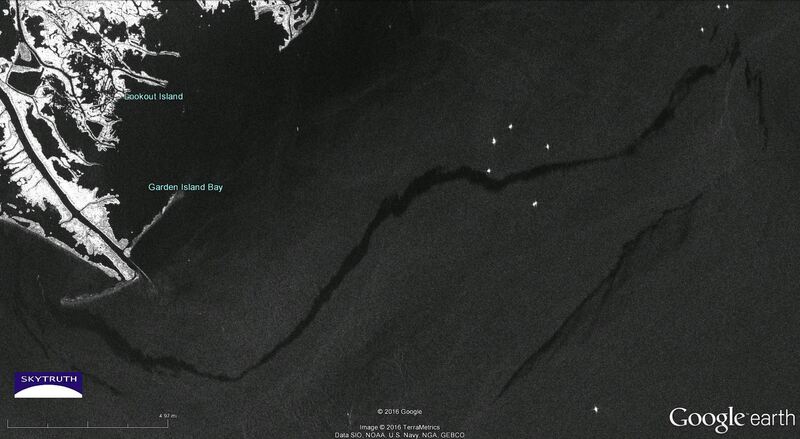 But the image is dominated by a thicker-looking 28-mile-long slick closer to shore. It seems to almost hook up with the Taylor slick on it’s east end, suggesting it could be a major continuation of the Taylor slick. This would make it one of the biggest slicks at Taylor we’ve ever observed; and if it is the Taylor slick, it makes a very unusual 180 degree turn. That’s possible, given the complex currents: outflow from the Mississippi River meets eddies spinning off the Gulf Stream, creating strong horizontal “shears” where the current on one side can be moving in a very different direction than on the other. But there may be a simpler explanation: this could be an oily slick caused by intentional bilge dumping from a moving vessel. Based on how the slick appears to be more pushed around by wind and current as you follow it back to the east, I’m guessing the vessel was moving from east to west, working its way around the tip of the Mississippi Delta parallel to shore. Image above, labeled to identify oil slicks and the location of the chronic Taylor Energy leak. 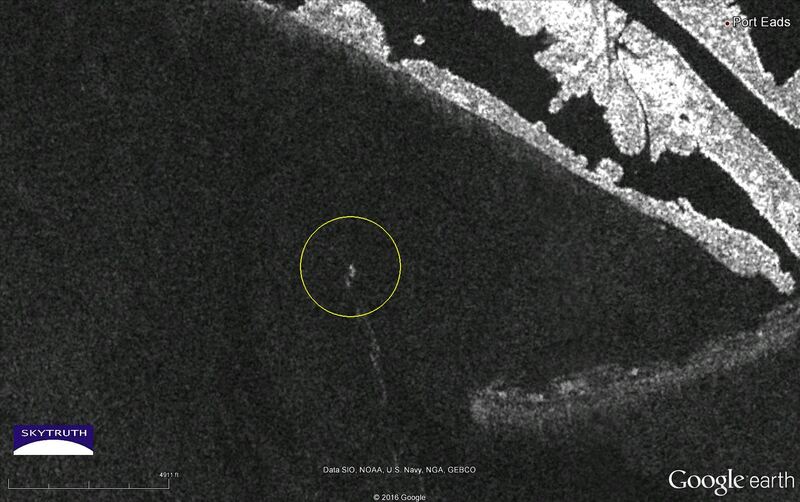 Possible vessel near west end of bilge slick marked by yellow circle. Sentinel-1 satellite radar image courtesy European Space Agency. Dumping oily bilge is illegal in US waters, and we don’t often see this here — although it is a big problem elsewhere. 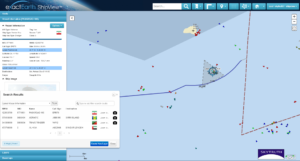 In this case, checking against our daily stream of Automatic Identification System (AIS) ship-tracking data, we haven’t been able to identify a possible culprit. There is a small bright spot near the west end of the slick that is probably a small vessel — there are no platforms or other structures at this location. This could be the culprit. But it wasn’t broadcasting an AIS signal. Detail from above, showing probable vessel located near west end of bilge slick. Is this the culprit? Sentinel-1 satellite radar image courtesy European Space Agency. The ruins of Pueblo Bonito. Image credit: National Park Service. 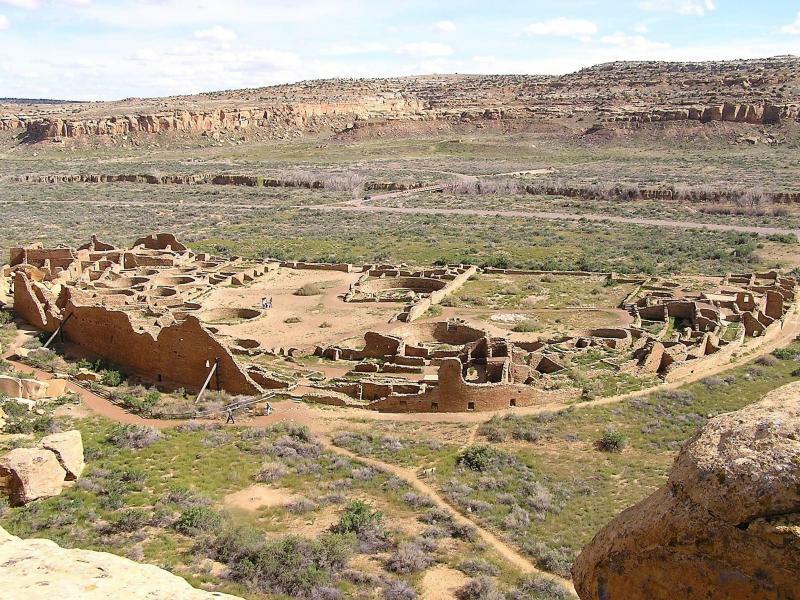 Approximately 20 miles from Chaco Culture National Historical Park lie 4 parcels of public land. These parcels have a combined size of 843 acres, and on January 21st, 2017 the oil and gas drilling rights to these parcels were auctioned off to drilling companies by the US Bureau of Land Management for $2.93 million. New Mexico has a total land area of 77,816,960 acres. These 843 acres correspond to a whopping 0.00108 % of the state’s total area, just a small drop in the bucket. The Bureau of Land Management provides data on all the leases of fluid mineral rights (oil and gas) which have been issued since 1929. At the time of sale, the most recent data from the BLM was listed as last updated on December 1st, 2016 (you can access the data here, it has since been updated). At that time the BLM database showed that 4,498,543 had been leased. The sale of these 4 parcels brought the total to 4,499,386 acres. That is 5.782% of New Mexico’s total land area. The impact of drilling — the 24/7 noise, lighting, dust, diesel fumes, air pollution, heavy truck traffic, and the risk of spills and other accidents that can pollute surface and ground water — goes well beyond the boundaries of the lease parcels. So the location of these leases matters. 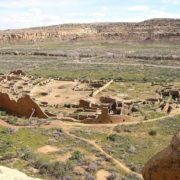 Chaco Canyon is a place of deep cultural and historical significance, anchored by the ruins of the massive Pueblo Bonito housing and ceremonial complex dating to the mid-800’s CE. The Navajo Nation recently joined with multiple tribes represented by the All Pueblo Council of Governors to call for a halt to leasing in the region. Let’s take a virtual tour of the oil and gas leasing near this uniquely special place. Is it too close for comfort? This video is a simulated Flyover of Chaco Culture National Historical Park and a set of nearby Oil and Gas leases which were auctioned off in January of 2017. The park is displayed in green, the auctioned leases in red. The video also denotes the location of several existing oil and gas wellpads using red arrows, and closes by showing the extent of existing oil and gas leases in the state of New Mexico. For a “real” flyover tour of the park and the drilling around it, check out this video from our friends at EcoFlight. 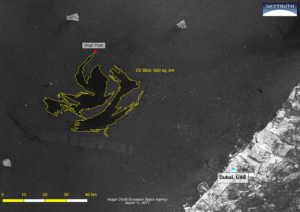 On March 14th we began investigating a report of suspected bilge dumping off the coast of Fujairah in the United Arab Emirates. 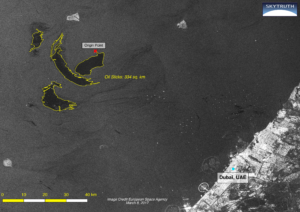 While we were unable to uncover any imagery of bilge dumping there, we did find some evidence of what appears to be a significant, ongoing oil spill in the Persian Gulf off the west coast of UAE. Based on patterns formed by what appear to be oil slicks, the spill appears to be originating as a leak emanating from a fixed point on the seafloor, such as a well or pipeline. 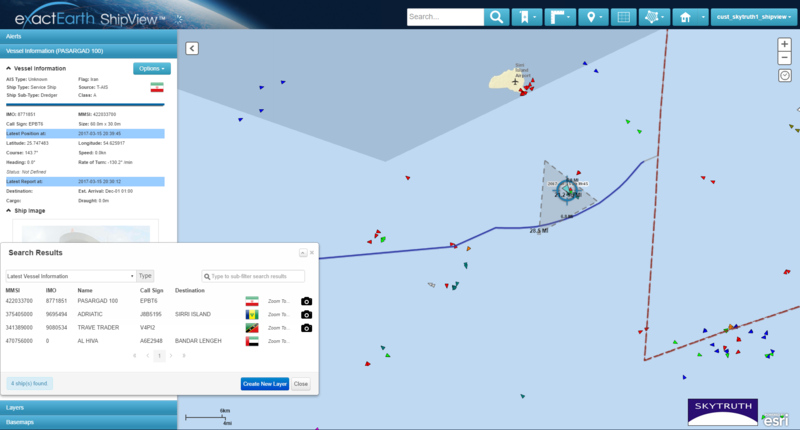 Vessel tracking data indicated the presence of a jack-up drill rig near the suspected origin of the spill, and this suggests that something went wrong either in the course of drilling a new well, or during the workover of an existing well. 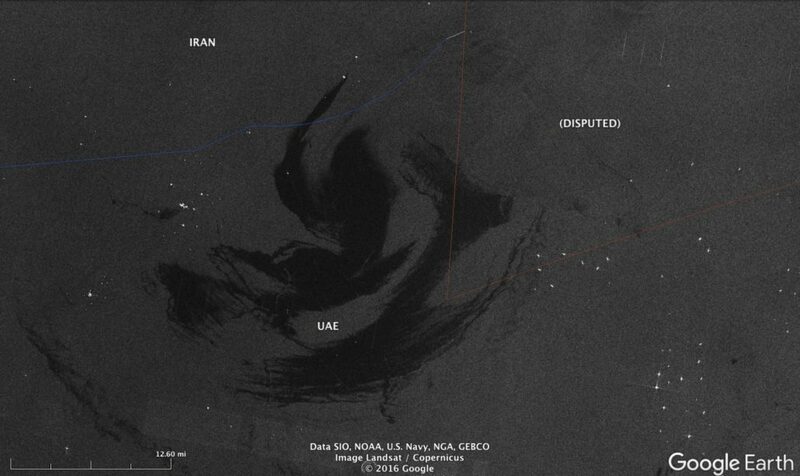 Vessel-tracking data from exactEarth, showing cluster of vessels (within the gray triangle) near suspected source of what appears to be a major oil spill in the Persian Gulf. One of these vessels, the Pasargad 100, is also known as the Liao He 300, an Iranian-flagged jackup drill rig. This image, collected by the European Space Agency’s Sentinel 1 satellite on March 8th, shows multiple slicks covering 128 square miles (334 square kilometers). Bright spots are vessels and platforms. This image, collected by the European Space Agency’s Sentinel 1 satellite on March 11th, shows an oil slick covering 239 square miles (620 square kilometers). Our estimates are based on the assumption that, on average, the slicks we’re observing on satellite imagery are at least 1 micron (one one-millionth of a meter) thick. That means every square kilometer of slick hold 264 gallons of oil. We consider this a conservative assumption. 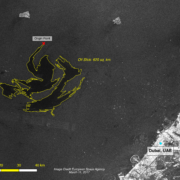 Landsat-8 satellite imagery from March 7, just one day before the first Sentinel radar image, doesn’t show anything unusual in this area, which suggests a sudden catastrophic spill. A Landsat-8 image from March 14 is partially obscured by haze but does appear to confirm the presence of a very large oil slick. We will continue to monitor this site to determine if this is a continuing spill. 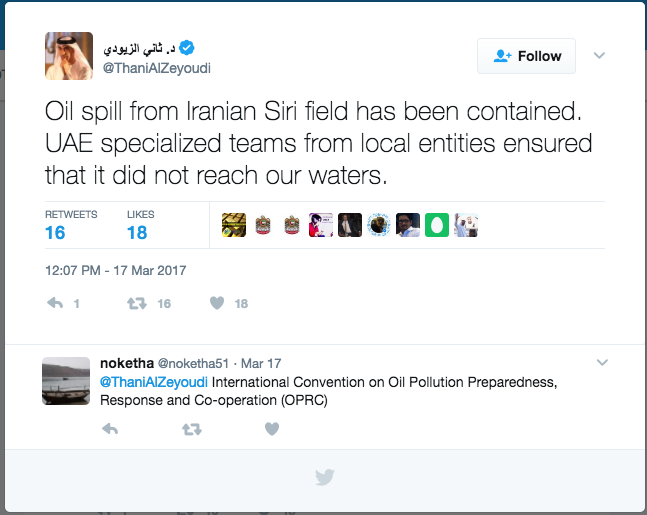 UPDATE 27 March 2017 – based on this tweet, we think these slicks were related to a spill in Iran’s Siri offshore oil field. Possibly related to their attempt to revive 18 previously abandoned wells? 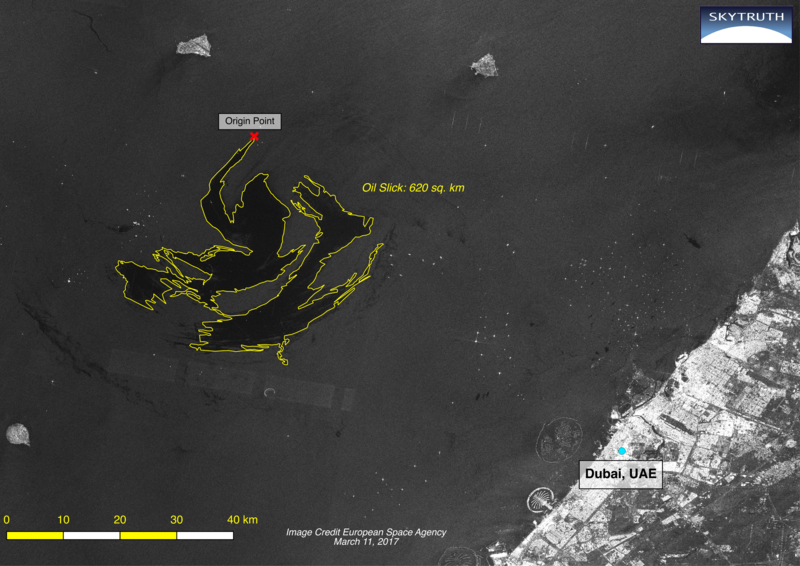 EEZ boundaries between UAE, Iran, and disputed waters superimposed on March 11, 2017 Sentinel-1 radar image showing apparent oil spill. Image courtesy European Space Agency.